As can be expected there is an increase in oxygen consumption with an increase in running speed. This occurs as follows. As exercise increase in intensity, the muscles recruit more myofibrils to produce ever more powerful contractions. This demands increased amount of energy, and this in turn demands a greater oxygen supply. Thus V02 max is the maximum rate of oxygen flow and is usually expressed relative to body weight (millilitres of oxygen per kilogram of body weight per minute) (Noakes, 1992). 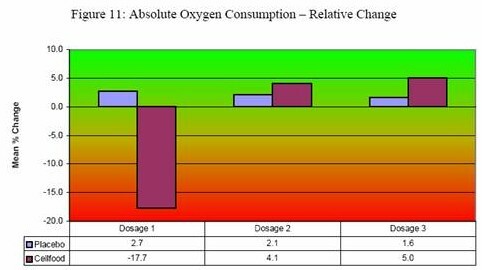 Higher oxygen consumption values would be beneficial to the endurance athlete by increasing the amount of oxygen utilized by the body to supply energy to the working muscles. V02 max is to a great extent determined by genetics and only a small percentage increase is possible by the correct training methods. resulted in an increase of 5%." It is clear that a certain pattern exists regarding the optimal dosage for performance when using the CELLFOOD® product. Concerning the haematology and the lactate accumulation CELLFOOD® was the most effective using a dosage of 39.2ml (35 drops once per day) while CELLFOOD® showed the best results in all the other variables when the subjects took a dosage of 44.8ml (40 drops once per day). This indicates that CELLFOOD® is more effective when it is administered at the higher of the tested dosages. Further studies could possibly answer the question if CELLFOOD® would reach an upper "threshold" dosage where after the efficacy would show a decline. In conclusion it would be best for athletes to make use of CELLFOOD® at a higher dosage to ensure better performance. METS: This term is used as an equivalent for maximal oxygen uptake. One MET is equal to 3.5ml/02/kg/min. This value is often used to determine a person's relative working intensity. RR: Respiration rate refers to the number of breaths taken per minute. Respiration rate multiplied by tidal volume is an indication of a person's minute ventilation. VT: This refers to tidal volume, which is an indication of the volume of air inspired per breath in ml. or liters. VE: This refers to the minute ventilation, which is an indication of the amount of air that is ventilated per minute (ml. or liters). V02: The maximum amount of oxygen that the body can take in, use and transport through the body to the working muscles. This is an accurate predictor of a person's potential to perform well at endurance events that make use of the aerobic energy system in the body. VC02: The amount of carbon dioxide that is exhaled from the body per minute. RQ: The respiratory quotient refers to the rate of carbon dioxide production to that of oxygen consumption. This value is a good indication of a person's work rate and also indicates what type of substrate is being utilized as energy, fat, protein or carbohydrates. VE/V02: The breathing equivalent for oxygen indicates the amount of air that needs to be inhaled to obtain one liter of oxygen. The lower this value during maximal effort the better the person's ability is to extract oxygen from ambient air. VE/VC02: The breathing equivalent for carbon dioxide indicates the amount of air that needs to be exhaled for one liter of carbon dioxide to be expelled. The lower this value the better the person's ability to rid the body of excess carbon dioxide. et02: End tidal expired oxygen partial pressure (mmHg) is the partial oxygen pressure (P02) determined in the respired gas at the end of an exhalation. etC02: End tidal expired carbon dioxide partial pressure (mmHg) is the partial carbon dioxide pressure (PC02) of the respired gas determined at the end of an exhalation.